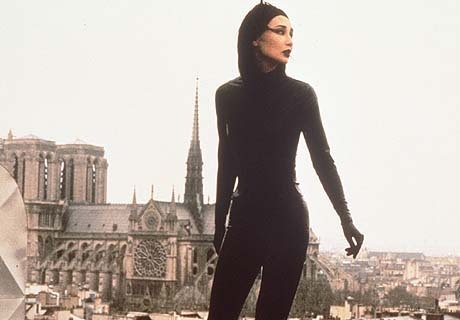 If you're a fan or an admirer of Maggie Cheung, try to find Irma Vep. It's a quirky, hilarious new French comedy about a director who hires a Hong Kong movie star called "Maggie Cheung" for his new project: to remake Louis Feuillade's 1915 silent classic Les Vampires. Fading, once-respected director "Rene Vidal" (Jean-Pierre Leaud) decides he can only make his vampire movie if it stars "Maggie Cheung" (played by, of course, Maggie Cheung), who somehow captured his imagination when he saw "Heroic Trio" in a theatre in Marrakesh. So he hires her, she arrives in Paris, and walks straight into a chaotic low-budget production, where she must endure an ill-fitting rubber cat suit ("I never want to see that suit again", she told us after we watched the film), Paris' miserable winter, and pretentious interviewers (when asked if what she really wanted to do was star in a John Woo picture, she pointed out that maybe he worked better with male actors...). The director can't seem to communicate what he wants from Maggie, the (female) costume designer falls for her, she has an adventure in her catwoman costume in a stranger's hotel room, and finally the director loathes his work and has a breakdown, throwing the whole project into jeapordy. Cheung shines in a film that, among other things, celebrates her face and her acting (lots of closeups); the camera is always investigating various ways of shooting Maggie, and believe me, they all work. There's a lot of Chungking Express-like energy to the movie: fidgity hand-held camera work, a loose, informal, hilarious script (written by Assayas in only 10 days), and lots of improvisational fun keep the movie fizzing, sparkling along. But not just light-headed fun: several supercharged hallucinatory scenes (set to a Sonic Youth song, and something screechingly post-industrial) are quite unsettling. And the final five minute scene -- Assayas' apotheosis of "Rene's" abandoned project -- combines scraps of scraped, scribbled-on footage of Maggie en vampire with a frenzied score into something gloriously and disturbing original. As Olivier Assayas said in his opening remarks at the Toronto Film Festival showing (September 6, 1996), he's done exactly what you're not supposed to do in a movie: make a film about film itself. But it works, brilliantly. It plays both as a weird, layered satire of French intellectual film-making (and satire of a particular kind of non-Asian hyper-intellectual film journalism/worship of Hong Kong action cinema), and as a welcome celebration of Maggie Cheung in the movies, and is a blast to watch. Also a blast to watch was Maggie Cheung (the real one) herself, who attended the premiere in Toronto, in platform running shoes, white jeans, and a pink shirt. No-one seemed to notice that she was standing outside the theatre, so Lisa Roosen-Runge and I introduced ourselves ("Don't be shy", said Maggie) and did the autograph thing (with HK magazines whose photo-spreads she didn't seem to know about; so she asked us if she could flip through them). Comrades, Almost a Love Story [Tian mi mi].